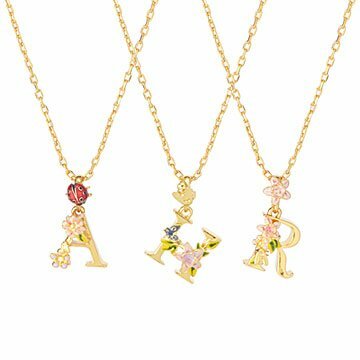 Bill Skinner adorns gold-plated initials with hand-painted bugs and blooms to create these necklaces. Is that soft shimmer a fluttering butterfly? Or a bright flower, seen just with the corner of your eye? Bill Skinner captures nature's little magical moments in these elegant initial pendants. Each charm in Bill's garden-inspired alphabet is adorned with hand-painted bugs and blooms, complementing the 14-karat gold-plated initial's beauty. It's a sweet gift for your queen bee or little love bug, or wear a favorite letter of your own. Handmade in the United Kingdom. Bill Skinner’s jewelry business is firmly rooted in his appreciation for creativity, craftsmanship, and quality. His first deep-dive into exploring his creativity was at Sir John Cass College of art, then as a rising craftsman in London, working for various clients. He went on to work in fashion, perhaps most notably with Butler & Wilson and Vivienne Westwood. When Bill launched his own brand, he vowed to keep that creative spark, believing that unconventional and interesting designs can also be the most beautiful and admired.